If you want a bird that's easily hand-tamed and perches on your finger, a finch isn't a good choice. While it's not impossible to train a young finch to finger perch, it's quite difficult. It's extremely unlikely that you could train an adult finch to stay on your finger. Finches have many other fine qualities, but a parakeet is a better choice if you're looking for a small, finger-perching bird. Finches crave the company of other finches -- humans, not so much. They should always be kept in multiples, whether as pairs or part of a larger group. 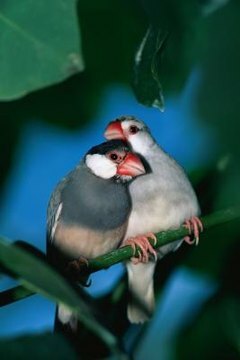 The zebra, Gouldian and society finches are the most common type kept as pets. Although they differ in appearance, they can be kept together. If you want to finger tame a finch, the colorful Gouldian is your best choice. They are the calmest of the three Finch breeds. While the Gouldian appears in a variety of bright colors, the society finch might be shades of white, brown or black, while the distinctive zebra finch is gray, black and white with orange facial patches. Before attempting to finger train a young finch, let him get used to your presence and your household. Once he's settled in, put your hand in his cage several times daily for a few minutes each time. When the bird gets used to this routine, start offering him treats, such as small pieces of fruit. When he feels comfortable, he will take a treat from your hand. Repeat this process until the bird routinely comes to you. Once the bird is comfortable with you, let him come to you and perch on your finger whenever you put your hand inside his cage. Once this in-cage finger perching becomes routine, prepare to move your hand out of the cage with the finch on your finger. First, finch-proof the room carefully before attempting to bring out a finch out of his cage, closing all doors and windows and dimming the lights. There's a good possibility he'll take off once out of the cage, but if you leave his cage door open, he'll probably fly back inside fairly quickly as his cage offers security. Keep repeating the process day by day. With luck, your pet will eventually stay on your finger until you are ready to put him back in the cage. There are times when you must handle your finch, such as nail trimming or examining a sick or injured bird. The Massachusetts Society for the Prevention of Cruelty to Animals website recommends placing your palm on the bird's back and wrapping your fingers around the finch. Put your forefinger and thumb on either side of the finch's head. Because the bird will be scared, speak softly to him, using a comforting tone of voice. What Is the Life Span for Canaries?